Made in the USA. A box with clear lid is great for resale items. 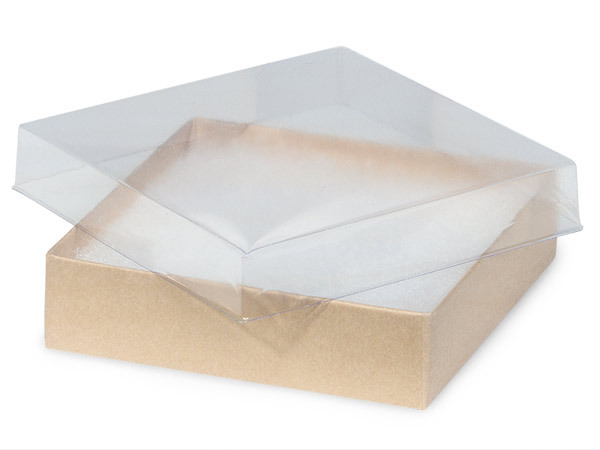 This 3-1/2x3-1/2x7/8" Kraft Base with Clear Lid Jewelry Box is filled with non-tarnishing synthetic cotton. This square box is perfect for necklaces, bracelets and larger pins. Jewelry boxes contain 100% recycled boxboard which is the largest component of the box by weight, does not include paper outer wrap. Many sizes are available in these versatile jewelry boxes. All boxes are filled with non-tarnishing ultra white synthetic cotton. These boxes are great for jewelry and small gifts. Packed in cases of 100, all are 2-pc. rigid set-up boxes. Pre-packed box assortments may also be available. Made in the USA. Jewelry boxes contain 100% recycled boxboard which is the largest component of the box by weight; the total recycled paper content is approximately 72% including coverings.